Many light sources, whether they’re, HID, fluorescent or LED, display color shifting over the course of their operating lives. How significant this color shifting is depends in large part on the type of light source and its operating age. Generally speaking, the longer a light source is operated, the greater the color shifting that takes place. Some lamp types experience color shifting sooner than others, and some experience a more significant color shift than others. For most types of lighting technology, color shifting is well understood and fairly accurate predictions can be made as to when color shifting will take place and how significant it will be. This has not been the case with LEDs however, largely because the dominant emphasis on LED lighting has been on increasing efficiency, and manufacturers and developers have provided limited data. All light sources produce light that is not truly white in color, but rather “tinted” coloration with a leaning towards a particular end of the electromagnetic spectrum. Depending on where within the electromagnetic spectrum a light source radiates its energy, or in other words the wavelength of the energy radiated, the color of the light produced will correspond according to the wavelength as well. Since temperature is closely aligned with the visible part of the electromagnetic spectrum, we refer to a light source as having a color temperature. An incandescent lamp for instance tends to produce a “warmer” white color, that is, a white that leans more towards the yellow orange end of the light spectrum. A metal halide lamp on the other hand tends to be higher in the color spectrum, producing a “cooler” white that is more closely aligned to the blue end of the light spectrum. This results in different lighting types producing distinctly different appearances when illuminating an object. A white sheet might appear a sort of dirty white when illuminated by an incandescent bulb, but when illuminated by a cool white fluorescent, appear sharply white in color. This shifting in color temperature can pose a problem when a light source is used within applications where consistent and accurate color rendering of objects is critical, such as in commercial or technological manufacturing applications. Color shift refers to the change in a light source’s CCT or Correlated Color Temperature over the operational life of the light source. As a light source operates over time, materials used in its construction deteriorate and their properties change, which in turn causes the color temperature of the light produced to change. This happens with most types of light sources, but in LEDs the process is far more complex because of the LEDs’ unique design and is less well documented. Although there are methods in place for measuring color shift in most traditional light sources, LED lighting represents a unique case that presents added difficulties as the old standards developed for traditional light sources such as incandescent and fluorescent lamps do not address the unusual properties of LEDs. The Illuminating Engineering Society of North America (IESNA) has developed “LM-80-08: Approved Method for Measuring Lumen Maintenance of LED Light Sources”, however, LM-80 provides limited color shift data and focuses more tightly on lumen maintenance over a limited required period of only 6,000 hours. The main contributing factors to color shift in LEDs tend to be operating temperature and the forward voltage applied. LEDs are extremely sensitive to changes in voltage and temperature, and both are closely intertwined in regards to how one affects the other. In one example, as forward current is increased more light is produced, until the ability of the LED to convert this energy into light is exceeded. When this occurs, degradation of the LED materials at an atomic level occurs, which in turn results in the LED losing some of its ability to convert energy to photons, in turn affecting color temperature and making the LED even more sensitive to high current. In another example, high heat buildup at the LED can result in higher drive current, which in turn creates more heat, leading to a process known as thermal runway and eventual failure. In order to maintain not only lumen output but the CCT of LEDs, manufacturers have put a great deal of effort into heat management and voltage control. Although a huge selling point for LEDs has been their cool operation, the reality is that LEDs actually do produce a considerable amount of heat for their size. The problem is the small surface area of the LED compared to the heat it generates. Since the actual lumen output compared to forward voltage is very high, and efficiency is around 30-50%, about 50-70% of the energy used ends up wasted as heat. Since heat creation is concentrated at the PN junction of the LED where voltage is fed into the chip and this area is so small, dissipating this heat is difficult. The result has been the inclusion of heat sinks to which LED assemblies are attached, which accounts for the unusual “finned” design of many commercial and industrial grade LEDs. Another way heat is addressed is with the inclusion of voltage management through pulse width modulation controls. This type of voltage management controls the duration of current applied to the LED, in effect turning voltage on and off extremely rapidly, far faster than the human eye can perceive. This causes the actual “on” time of the LED to be lower than were it simply connected to uninterrupted current, which in turn reduces heat generation. 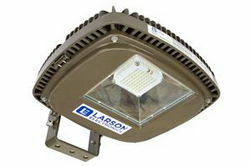 Additionally, such controls offer added benefit in that the LED can actually be driven near 100% of voltage capacity for maximum output without causing premature color shifting or reduced LED life, and heat can be actively monitored and the duration adjusted accordingly to provide active heat management in extreme environments. This type of advanced current management is much preferable to the simple addition of resistance and underdriving commonly done with lower grade LED assemblies. Although underdriving an LED does improve longevity and preserve average CCT by simply lowering forward voltage and thus heat generation, it reduces the total lumen output and tends to lower the actual color temperature achievable were the LED driven near 100% capacity. Although color shifting of light sources is inevitable, it can be managed to produce a more consistent color temperature over the life of the light source. Because the strength and value of LEDs lies within their high efficiency and long life, it is important that LEDs also maintain their CCT over the course of their operational life. Although an LED may achieve high efficiency and good lumen maintenance, if its CCT degrades prematurely, the practical useful life of the LED can be shortened as well. Currently, studies show LEDs of quality manufacture do indeed display superior CCT maintenance over competing lighting technologies, with degradation not becoming visually apparent for tens of thousands of hours for better units. At this point it is clear, although LEDs do indeed experience color shifting, they continue to remain ahead of other lighting technologies in terms of lumen maintenance, longevity, and CCT consistency.